The Peterson Society inducted 27 new members during the society’s annual luncheon, Thursday, September 13. President Katherine Conway-Turner and Vice President for Institutional Advancement James Finnerty hosted the event at the new Jacqueline Vito LoRusso Alumni and Visitor Center. The 27 new members inducted this year included, Eleanor C. (Dolacinski) Ash, ’77; Audré J Bunis; Robert W. Collin,’78; Elizabeth A. Doherty; Rock D. Doyle, ’99; Todd B Duval, ’10, ’12; Anonymous F.; Scott Goldman; Anonymous H.; Peter Hall; Mary E. O’Leary, ’72; F. Dean Hanson, ’59, and Elizabeth J. Hansen, ’59; James E. Hofmeister, ’61, ’70; Joyce Day Homan, ’55; Ross B. Kenzie; Melanie L. Perreault and Karen F. Silverstrim; Russell J. Ram, ’74; Anonymous R.; Samuel Saia Jr.; Carol J. Scorsone, ’83; Catherine Tillou; Dana E. Tillou; Michael E. Urbanski, ’66; Anonymous W.; and Mark K. Warford. Calvin Northrup, recipient of the Jacqueline V. LoRusso Music Scholarship and LeeAnn Grace Music Scholarship in Voice, was the student speaker. 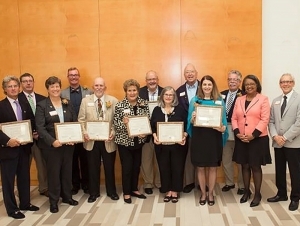 The Peterson Society honors those who have graciously given to the college and/or the Burchfield Penney Art Center through a gift annuity, charitable trust, life insurance policy or other estate-planning means. The Society is named after the late Harold F. Peterson and his late wife, Lucille Mattern Peterson, ’39, in honor of their legacy of giving to Buffalo State. Their legacy and dedication to Buffalo State lives on today, continuing to benefit students who aspire to follow in their footsteps of scholarship and leadership. To learn more about becoming a member contact the Buffalo State Development Office, Cleveland Hall 412, at (716) 878-4508.